Last week I attended the Airborne Commemoration in Heteren, Netherlands. This was the second year I attended this commemoration. Heteren is near the area where the Airborne fought on the dikes after Operation Market Garden, in the area they call the “Island.” Many soldiers, including Bernard Tom, who I wrote about last week, fought and died on the dikes near Randwijk just up the road. A few re-enactment groups attend the commemoration and act as Honor Guard, bringing in the colors and being present to witness the remembrance. My husband’s group, Band of Brothers in Belgium and the Netherlands provided the colors again this year. The re-enactors often arrive in their WWII vehicles and always dressed in period uniform. One thing I appreciate about every commemoration I’ve attended here, is the fact that children are a part of each one. Students in school in the Netherlands are taught about WWII and the effects it had on the Netherlands. They learn about the sacrifice of our American soldiers and all Allied soldiers, and what that means for their freedom. School children prepare short stories or poems, which are read during the commemoration. They also bring flowers and drawings to leave by the memorial. Wreaths and bouquets of flowers are brought forward by the children for individuals or groups who sponsor the flowers. They are laid on wreath holders or the monument itself. The Last Post is played by bugler as the flag is lowered slightly by the honor guard. Then the Dutch and American National Anthems are played as the flags are raised on the flag pole – Dutch, Airborne, and American. Even though the entire ceremony is in Dutch, and I only pick up a few words here and there, it is a moving ceremony. Several soldiers were named from those who died on the dikes, including Bernie Tom. Read last year’s article, Honoring Service – Engaging Children in WWII Research. 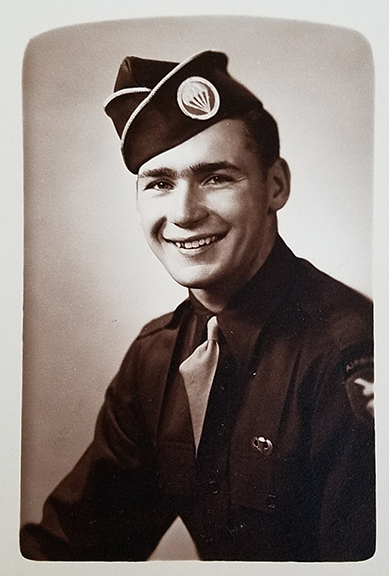 Today we remember PFC Bernard (Bernie) Tom of F Company 506th Parachute Infantry Regiment 101st Airborne, who was Killed In Action on the dike between Randwijk and Heteren, Netherlands, near the Crossroads. If you know where Dukeman was killed and turn around, that is where F Company also fought. 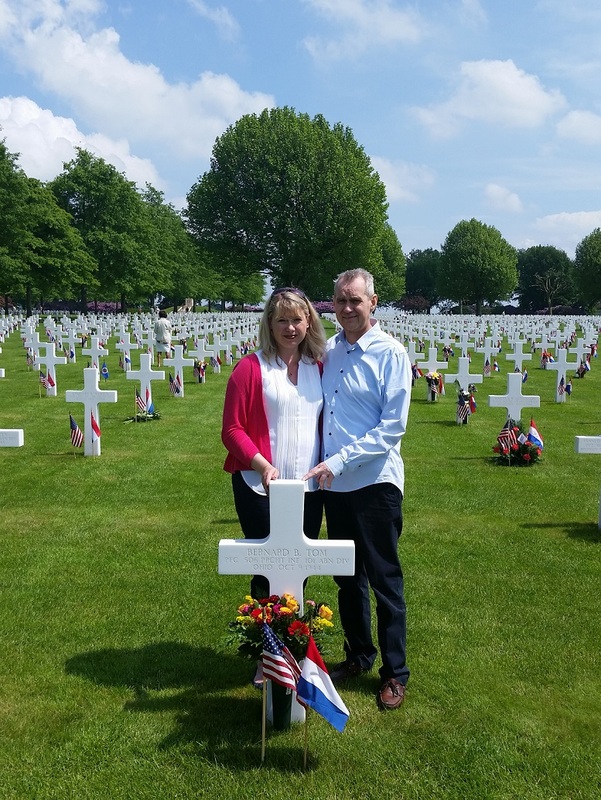 My husband, Johan van Waart, adopted Bernie’s grave at Margraten (Netherlands American Cemetery). Several years ago he connected with one of Bernie’s nephews and niece in-law, who gave Johan a collection of photographs, documents, and over 100 letters Bernie wrote just prior to joining the Army until just before his death. These letters have never been published. I started reading these letters and after reading 39, I have a better idea of who Bernie was as a man and soldier. I know about people in his family and town. I am able to document much of his service history that may have been in his OMPF (it did not survive the fire). I’m also learning a lot about the training itself. This is the first article about the contents of Bernie’s letters and what we can all learn by reading wartime letters. Bernie’s OMPF (service file) burned. Only seven pages remain which contain letters and requests for information written by relatives in the 1980s. The information provided in this article is only the tip of the iceberg. My target is to help readers understand the depth of information you can find in these family letters. The letters begin on 3 November 1942, when Bernie is living in Akron, Ohio, having left Athens, OH for work. His letter mentions he took his exams for the “Navy and the Air Corps.” He wished to fly planes, based on the information in his letters. Once Bernie is in the military, much of the paper he uses to write letters is on camp letterhead or some really cool Paratrooper letterhead. His letters are primarily written with fountain pens in ink colors of red, black, and various shades of blue, though a few are in pencil. Using the envelopes that are with each letter, I am able to establish a timeline of his service history because some of his letters only say “Saturday evening”. The envelopes are important because not only do they have the date they were posted but also from where. Without the envelopes, I would not have known he spent a lot of time at Camp Mackall. It is so important if you have envelopes with the letters to keep them with the letters! I can document the units and training camps Bernie was in until the point he officially entered the 101st Airborne. Bernie mentions as he is transferred from one unit to another (and camp to another) his service records are “lost” and it takes a long time for them to make their way to his current location. This caused him some issues with rank and pay while waiting for his records to show up. Many of his letters mention family members, including his brother who is in the Army Air Forces. He mentions many of the friends from Athens, Ohio, he knew. This information is especially important for anyone writing about wartime in Athens, Ohio. It was a small town and using letters from soldiers, may provide information about the whereabouts and service of the young men who left to fight. He documents some, but not all of his jumps, with details about each one. Using the letter dates, I can tell you what dates he jumped. His letters indicate the day he received his jump boots. I learned more about his paratrooper training and when he is transferred after training to a replacement depot and heads overseas. Bernie was not officially in an Airborne unit until early 1944 when he is overseas. There is so much information in these letters, it would take a book to explain it all. I hope this first article gives you an idea of who Bernie was, a little about his service, and the depth of information you can find in these letters. Thank you Bernie for your service. We will keep you memory alive. Does your family have letters from your soldier? Are the envelopes in which they came still with the letters? What information can you learn about your soldier’s service history, his family, and life from these documents?